Cerebrovascular disease (e.g. stroke): Disease pertaining to the blood vessels in the brain. A cerebrovascular accident or stroke is the result of an impeded blood supply to some part of the brain. 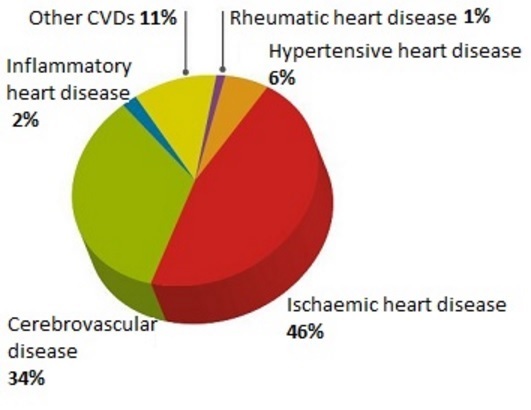 Ischemic heart disease (e.g. heart attack): Heart ailments caused by narrowing of the coronary arteries and therefore a decreased blood supply to the heart. Hypertensive heart disease: High blood pressure may overburden the heart and blood vessels and cause disease. 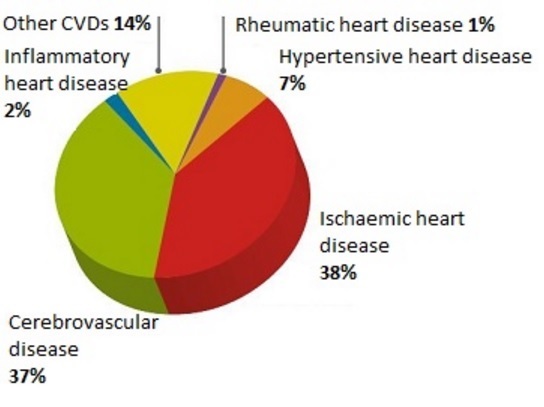 Rheumatic heart disease: Rheumatic heart disease is caused by one or more attacks of rheumatic fever, which then do damage to the heart. Inflammatory heart disease: Inflammation of the heart muscle (myocarditis), the membrane sac (pericarditis) which surround the heart, the inner lining of the heart (endocarditis) or the myocardium (heart muscle). Cerebral vascular disease is caused by atherosclerosis, that is the narrowing and / or blockage of the blood vessels that flow to the brain. If the flow of blood is cut off this can lead to strokes and transient ischemic attacks. A stroke occurs when the blood supply to the brain is interrupted. This can happen either when a blood vessel in the brain or neck is blocked or bursts. If this happens, your brain is deprived of oxygen and parts of your brain may be permanently damaged. A stroke can kill or leave you with a permanent disability. The consequences of a stroke can include problems with speech or vision, weakness or paralysis. Click here to learn more about stroke and its relations to blood clots and hypertension. Just as stroke occurs when the flow of blood is blocked, TIAs happen when there is a brief blockage. The temporary loss of blood to the brain causes a brief, sudden change in brain function. This may manifest as temporary numbness or weakness on one side of the body, loss of balance, confusion, blindness in one or both eyes, double vision, difficulty speaking, or a severe headache. But these will disappear quickly and permanent damage is unlikely. Angina manifests as pain in the chest that results from reduced blood supply to the heart (ischemia). Blood carries oxygen around your body and depriving the heart of oxygen has serious consequences. Angina is caused by atherosclerosis, that is the narrowing and / or blockage of the blood vessels that supply the heart. The typical pain of angina is in the chest but it can often radiate to the left arm, shoulder or jaw. If you have angina you will have noticed that the pain is related to exertion and is relieved by rest. An angina attack is also associated with shortness of breath and sweating. If you are a woman you may experience angina slightly differently. Women appear to have more pain in their shoulder and middle back area, and more throat, neck, and jaw pain than men. If your angina symptoms rapidly worsen and occur at rest this may presage an impending heart attack (myocardial infarction) and you should seek medical help immediately. Coronary artery disease is caused by atherosclerosis, that is the narrowing and / or blockage of the blood vessels that supply the heart. 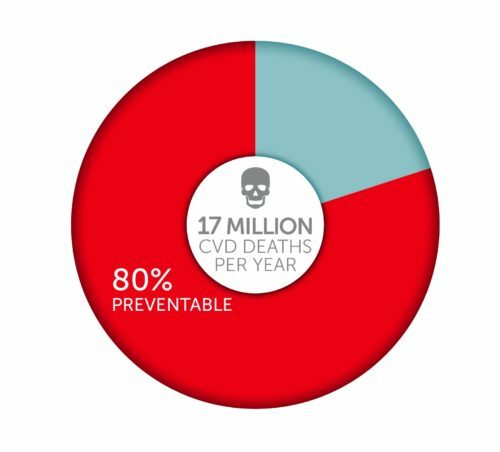 It is one of the most common forms of heart disease and the leading cause of myocardial infarction (e.g heart attacks) and angina. Coronary heart disease refers to the disease of the arteries to the heart and their resulting complications, such as angina and heart attacks. A heart attack (myocardial infarction) occurs when the heart’s supply of blood is stopped. A heart attack may not be fatal, especially if you receive medical attention and treatment to deal with the blockage soon after you have your heart attack. But you are likely to be left with a damaged heart post heart attack. A heart attack manifests as severe central chest pain, which may also radiate to the left arm, shoulder or jaw. Severe shortness of breath, sweating and feeling faint are common additional symptoms. Learn more about the warning signs here. Sudden death occurs when there is an abrupt loss of the heart’s ability to pump blood. This may be because of heart attack or serious abnormality of the heart’s rhythm. An aneurysm is a bulge or weakness in the wall of a blood vessel. Aneurysms can enlarge over time and may be life threatening if they rupture. They can occur because of high blood pressure or a weak spot in a blood vessel wall. Aneurysms can occur in arteries in any location in your body. The most common sites include the abdominal aorta and the arteries at the base of the brain. High blood pressure is the excessive force of blood pumping through your blood vessels. High blood pressure causes many types of cardiovascular disease, such as stroke and heart failure, and renal disease. Peripheral arterial disease (PAD) is caused by atherosclerosis, which is the narrowing and / or blockage of the blood vessels in the legs. PAD manifests as pain in the legs when walking, which is relieved by rest. If you have PAD you are at greater risk of developing gangrene in your legs. Rheumatic heart disease is damage caused to the heart’s valves by rheumatic fever, which is caused by streptococcal bacteria. The heart’s valves keep blood flowing through the heart in the right direction. But a variety of conditions can lead to valvular damage. Valves may narrow (stenosis), leak (regurgitation or insufficiency) or not close properly (prolapse). 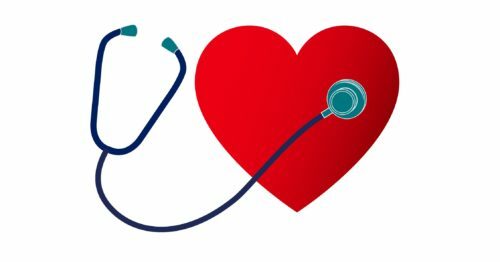 You may be born with valvular disease, or the valves may be damaged by such conditions as rheumatic fever, infections connective tissue disorders, and certain medications or radiation treatments for cancer. Cardiomyopathy refers to diseases of the heart muscle. Some types of cardiomyopathy are genetic, while others occur because of infection or other reasons that are less well understood. One of the most common types of cardiomyopathy is idiopathic dilated cardiomyopathy, where the heart is enlarged. Other types include ischemic, loss of heart muscle; dilated, heart enlarged; hypertrophic, heart muscle is thickened. The sac that encases the heart is called the pericardium and it can be affected by a variety of conditions such as inflammation (pericarditis), fluid accumulation (pericardial effusion) and stiffness (constrictive pericarditis). The etiology of these conditions varies. Congenital heart disease is when you are born with malformations of the heart’s structures. This may be the result of the genes you inherited from your parents or adverse exposure to certain elements while still in the womb, such as some medicines or too much alcohol. Congenital heart disease is a broad term and examples are holes in the heart, abnormal valves, and abnormal heart chambers. Heart failure is a chronic condition that happens when the heart’s muscle becomes too damaged to adequately pump the blood around your body. If you have heart failure your heart still works but because it is less effective your organs do not get enough blood and oxygen. Heart failure tends to affect older people more often and manifests as shortness of breath, reduced exercise tolerance and swelling of the ankles. It results if the heart is damaged and weakened. An arrhythmia is a problem with the rate or rhythm of the heartbeat, where the heart beats irregularly, too fast or too slow. Most arrhythmias are not dangerous, but some can be serious or life threatening. Common types of arrythmias include atrial fibrillation (the heart contracts in an irregular way at a high rate), bradycardia (when the heart beats irregularly or too slow), and supraventricular tachycardia (when the heart beats irregularly or too fast). 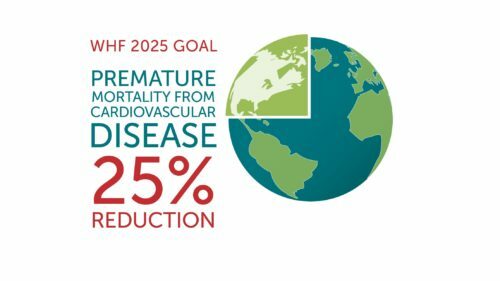 World Heart Federation President Salim Yusuf leads Hope-3 trials on the prevention of heart attacks and strokes.